Do you know Tehran has lost nearly 10,000 people to air pollution in just over a one-year period?! This air pollution related death scores 3,600 in a month! – according to Iranian officials. Smog is responsible for most of these deaths — caused by heart attacks and respiratory illnesses. The air pollution problem has scaled a height leading one senior official to describe the living in the Iranian capital as — “collective suicide”. It is a very serious and lethal crisis, a collective suicide. A real revolution is needed to resolve this problem. It is in last year October alone, the air quality of Iran had worsened linking to some 3,600 deaths! Many of the deaths occurred during the period were by heart attacks brought on by the air pollution. 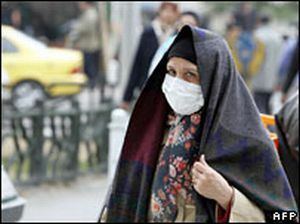 Recently pollution-related deaths here have risen sharply with new figures showing 9,900 people’s death caused by pollution in the previous Iranian year – i.e. March 2005 to March 2006. Extrapolating mortality rates according to certain levels of pollution, the latest assessments were based on World Bank figures.